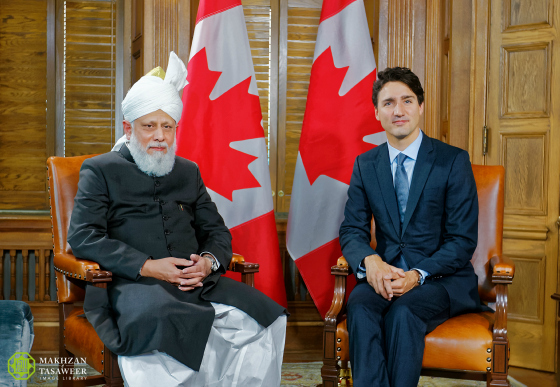 Prime Minister of Canada receives Head of Ahmadiyya Muslim Community in Ottawa. Prime Minister Trudeau welcomes Hazrat Mirza Masroor Ahmad to Ottawa. On 17 October 2016, the World Head of the Ahmadiyya Muslim Community, the Fifth Khalifa (Caliph), His Holiness, Hazrat Mirza Masroor Ahmad was received by the Prime Minister of Canada, Rt Hon, Justin Trudeau at the Prime Minister’s Office in Ottawa. During the meeting, Prime Minister Trudeau expressed his pleasure at welcoming His Holiness to Canada. 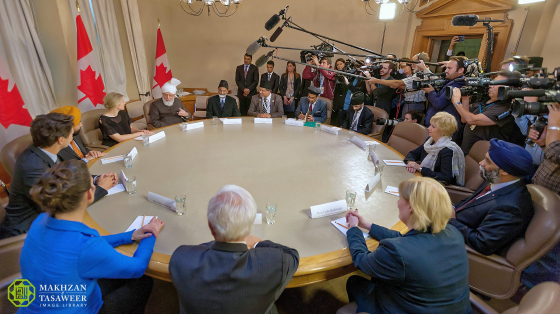 The Prime Minister thanked His Holiness for his continued efforts to promote peace worldwide and stated that his Government greatly appreciated the efforts of the Ahmadiyya Muslim Community in Canada and considered it to be an integral part of the nation. Hazrat Mirza Masroor Ahmad thanked the Prime Minister for his words and said that he wished to personally congratulate the Prime Minister on his election last year. His Holiness also said that he had listened to Question Period in the House of Commons earlier in the day and he had noted that a number of the “burning issues of today” had been discussed and debated. Thereafter, His Holiness attended a meeting with the Prime Minister and 6 Federal Ministers. In the meeting, the Prime Minister again appreciated the efforts of Hazrat Mirza Masroor Ahmad to spread peace in the world. The Prime Minister also congratulated the Ahmadiyya Muslim Community in Canada on its 50th anniversary. Hazrat Mirza Masroor Ahmad recalled his previous meeting with the Prime Minister in 2012, which took place in Peace Village. At the time, Mr Trudeau was not leader of the Liberal Party. Further discussions then took place about the need for inter-faith dialogue amongst different communities, the importance of education for all people and of religious freedom. His Holiness expressed his concerns about the continued rise of extremism and terrorism in different parts of the world and the associated risks in the Western world. He said that he considered the 2008 global financial crash to be a major cause of the terrorism witnessed in the world today. His Holiness said high unemployment and a state of financial desperation and hopelessness had led certain Muslim youths to becoming vulnerable to extremism. Thus, he said that providing job opportunities and helping people stand upon their own feet was a means of ensuring national security. Hazrat Mirza Masroor Ahmad reiterated that all forms of terrorism and extremism were not linked to Islam. Share the post "Prime Minister of Canada receives Head of Ahmadiyya Muslim Community in Ottawa."